A global humanitarian aid group reports 58 new cases of Ebola in the Democratic Republic of Congo last week -- the highest weekly number this year. The International Rescue Committee says the real number may be higher. "With mistrust and security issues, cases are likely to be going unreported," the IRC said Sunday. 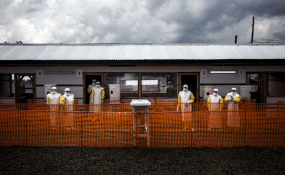 "These numbers show that despite the hard work being done, this outbreak is far from over. Insecurity and violence has led to the IRC and other agencies being forced to frequently suspend programs, which time and again we have seen lead to a spike in cases," the agency said.